As a region famous for its beaches, golf courses and luxury residential areas, the Costa del Sol in Southern Spain offers a fantastic variety of settings, homes and lifestyle. The glamorous Golden Mile is Marbella’s most prestigious address featuring a property for every taste and style, from the traditional family villa to stylish penthouse apartments offering stunning views and multi-million euro homes with a world of exclusivity. The Golden Mile is also home to two of Europe’s most celebrated hotels, The Marbella Club and the Puente Romano Hotel & Spa, both of which feature a wide selection of facilities. 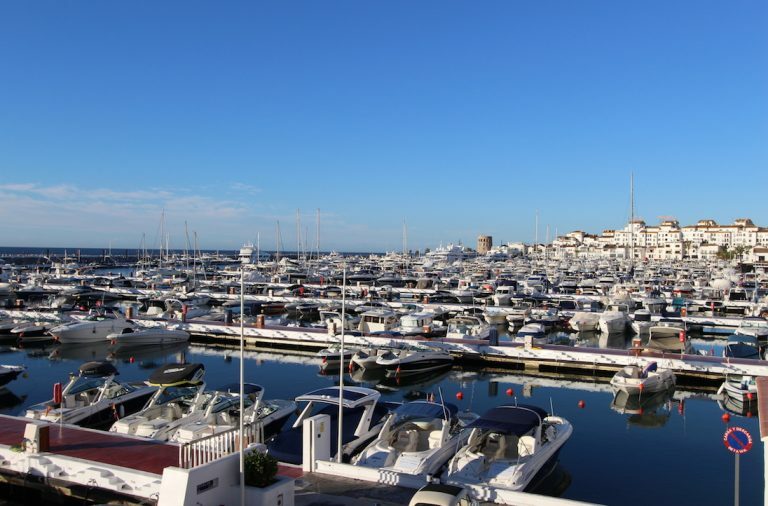 Puerto Banús is synonymous with luxury; the world famous marina is home to an impressive collection of yachts, supercars and high-end designer brands. Often referred to as the playground of the rich and famous, the stylish port features a large offering of vibrant beach clubs, elegant restaurants and lavish nightlife. Spain’s iconic department store El Corte Inglés, a stylish marina mall and a large cinema also reside in Puerto Banús, just a few streets behind the yacht harbour. Here the elegant whitewashed apartments overlook the sparkling water of the port, while the picturesque La Concha mountain provides a scenic and soothing backdrop. 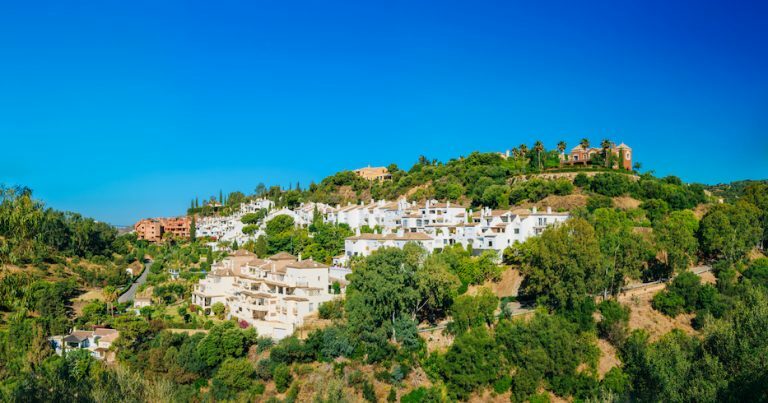 Nueva Andalucía is an upmarket residential area featuring Mediterranean style townhouses, contemporary hillside villas and stylish frontline golf apartments and penthouses. 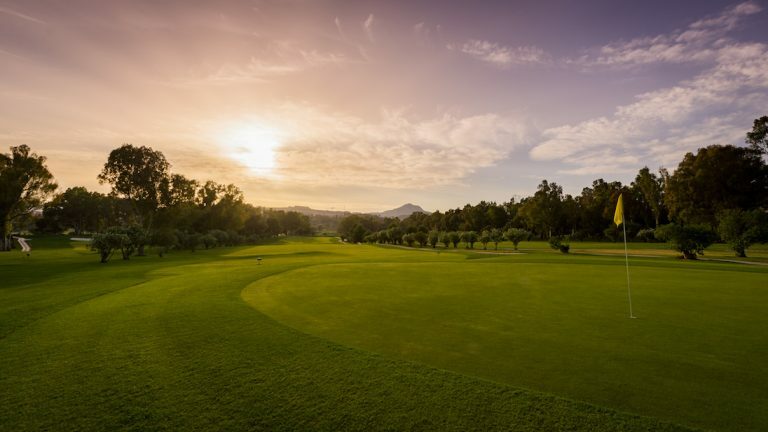 The area is home to a vast number of scenic urbanisations, most of which line some of the top golf courses in Marbella, including Las Brisas, Los Naranjos and Aloha Golf. 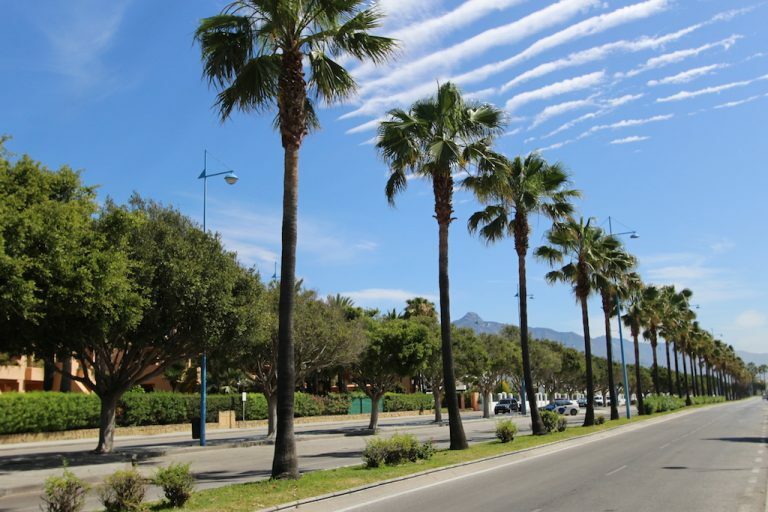 Guadalmina is divided into two areas, Alta and Baja. Guadalmina Alta is a tranquil urbanisation featuring stunning golf and mountain views. The area boasts a selection of modern frontline golf villas, contemporary penthouses with sea and mountain views, and corner townhouses set within private gardens. 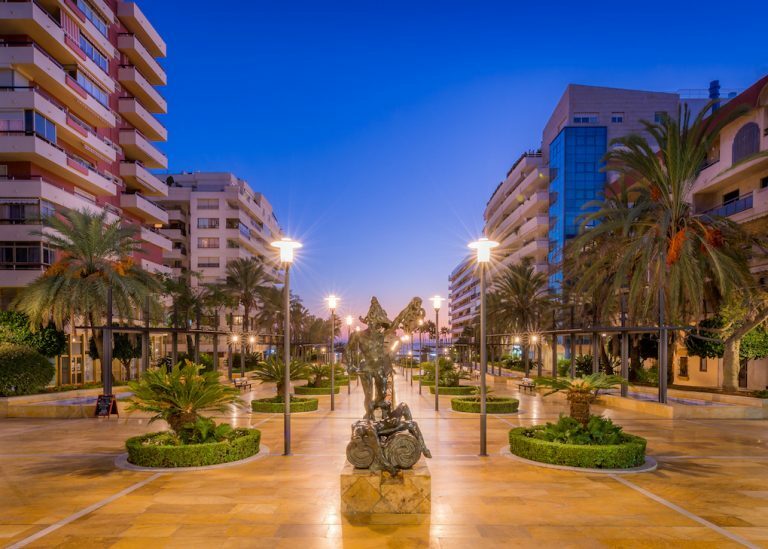 Guadalmina Baja —a seaside urbanisation— features exceptional family villas, most of which comprise sea views and are within a short walk to amenities such as a commercial centre, supermarket, restaurants, cafés and clinics. From here it is also possible to take a leisurely stroll to the nearby and fashionable town of San Pedro. San Pedro is a lively town that is fast becoming the place to be seen on the Costa del Sol. One of the main attractions of San Pedro is the charismatic old town centre which features the Plaza de la Iglesia, a romantic Spanish square that is home to a beautiful church surrounded by narrow winding streets. The old town is home to traditional Andalusian style townhouses. The recently constructed boulevard is one of the main attractions in town. 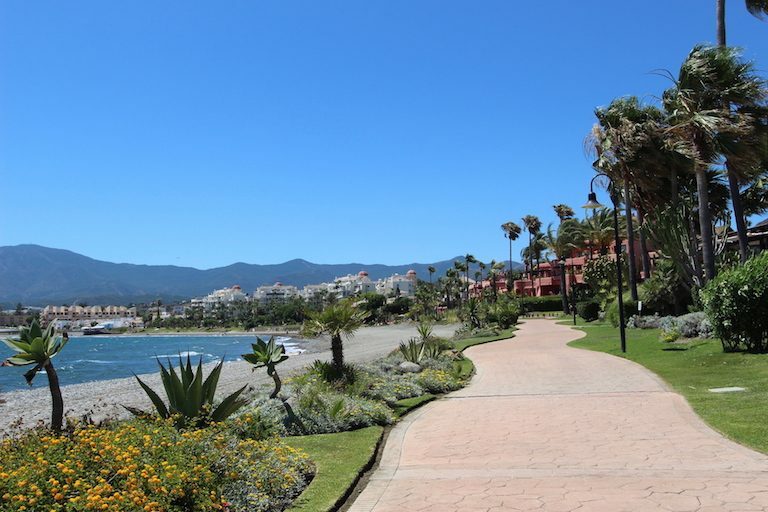 The San Pedro beachfront and its modern Nueva Alcántara area, which extends between the beach and the town’s new boulevard, boasts contemporary apartment complexes, penthouses overlooking the sea and also borders leafy streets with villas. It is also here that you will find a selection of attractive beachside restaurants offering fresh seafood and stunning sea views. In addition, Nueva Alcántara is closely linked to major golf courses. 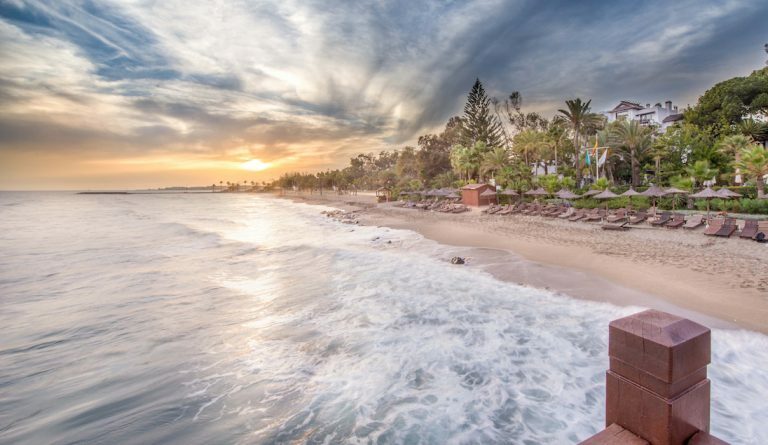 Marbella East enjoys some of the best beaches on the coast, serene woodlands and an abundance of tranquil green zones and beautiful golf courses. The area has long been a favourite with locals and tourists alike due to its relaxed setting and superb views. 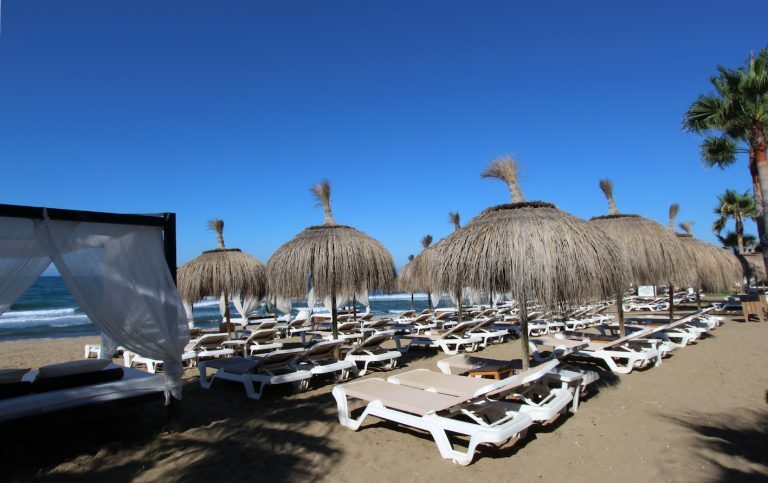 East Marbella is home to many five star hotels and beach clubs, including Nikki Beach, Don Carlos Resort & Spa, Los Monteros Spa & Golf Resort and La Cabane Beach Club, as well as top medical facilities and schools. From the enchanting Old Town (Casco Antiguo) with its winding cobbled streets, colourful central square (Plaza de los Naranjos), charming restaurants and traditional architecture, the buzzing Ricardo Soriano avenue with its tasteful stores and vibrant cafés to the charming marina lined with inviting bars and endearing white boats bobbing in the water, Marbella offers something to satisfy every desire. The trendy Paseo Marítimo stretches all the way along the pretty beachfront, which features scenic cafés, bars, restaurants, ice cream parlours and more. Located between San Pedro Alcántara and Estepona, the New Golden Mile is made up of two separate areas that are divided by the coastal A-7 road. The seaside area features the luxury beachfront apartments near the Healthhouse Las Dunas Hotel and those surrounding the Kempinski Bahia Estepona resort. On the inland side, and closer to San Pedro, the frontline golf area near El Paraiso and Atalaya is surrounded by magnificent properties. 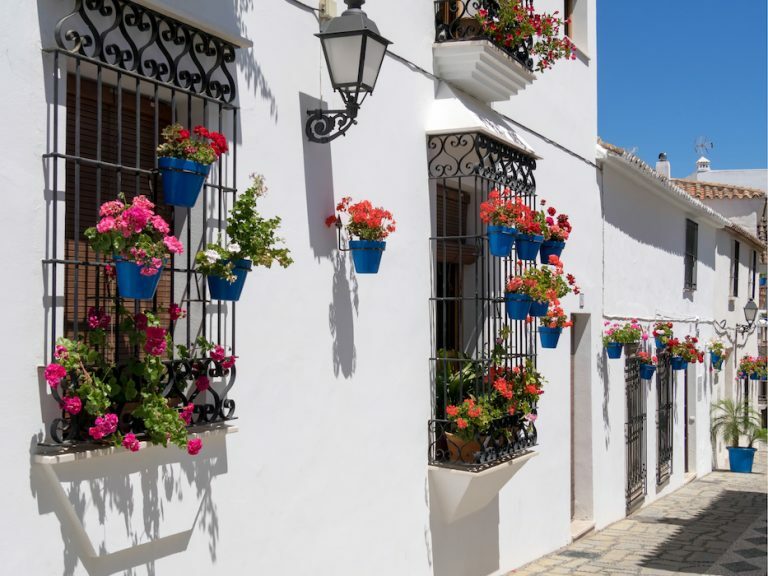 Estepona is a charming seaside town with a traditional Spanish pueblo feel. Here the pedestrianised old town is decorated with colourful flowers and is full of traditional cafés and bars that line the cobbled streets, creating a picturesque setting. The town includes a large variety of facilities, while activities such as golf, horse-riding and animal parks are all within easy reach. 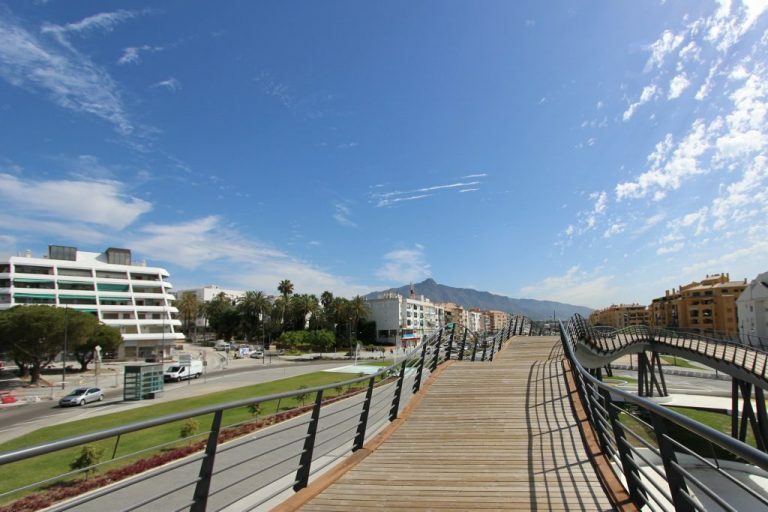 Estepona’s beach promenade is one of the longest and most scenic on the coast, offering uninterrupted views over the Mediterranean to North Africa. 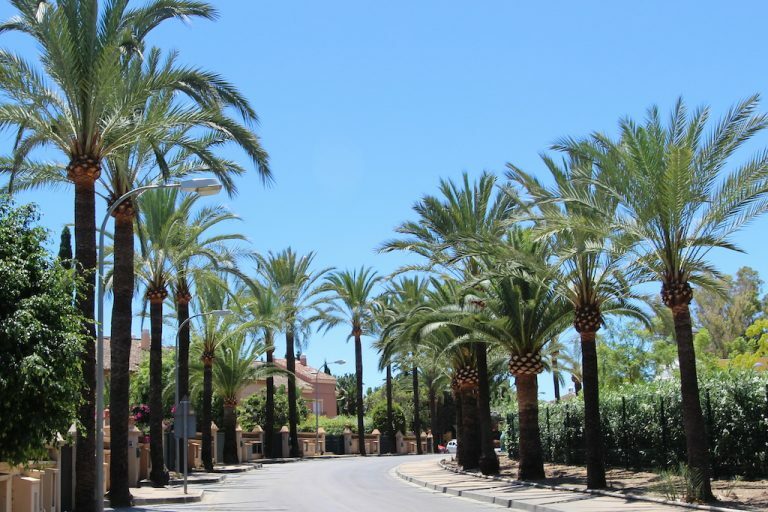 The mountain village of Benahavis is located just inland and set against a stunning mountain backdrop. Its streets are steep, the houses feature whitewashed walls and the hillside views are breath-taking. Benahavis is known as the gastronomical heart of the Costa del Sol, endowed as it is with a large selection of dining options. Also within the municipal boundaries of Benahavis are exclusive country clubs like El Madroñal, home to exquisite villas.